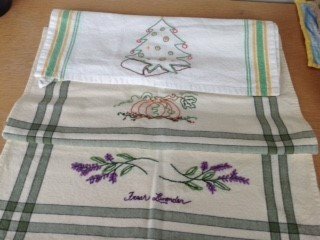 You will make a Holiday or Autumn inspired dishtowel that uses the Running Stitch, Backstitch, Chain Stitch, Buttonhole Stitch, French Knot and other beginning stitches. Choose a design from Pattie’s vast collection or bring your own. We will transfer your design to the dishtowel using a transfer pen, dressmaker’s carbon, or water soluble transfer paper. If you have taken Pattie’s Beginning Embroidery, this is a good next step class. But, if you are rusty in your Embroidery skills, don’t worry. Pattie will also review how to do each stitch.